With the Beast from the East now a distant memory, spring bulbs popping up across campuses and (finally!) some sunshine and blue skies, it’s time to start planing for the Summer exam period. 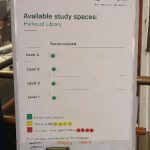 In Libraries we know how hard it can be to find a space to study during exam season. We also appreciate it can be a stressful time for many students. But did you know we can help you to find study spaces and available PCs around University Park, Jubilee and Sutton Bonington campuses? 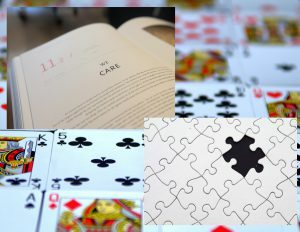 And that we work with colleagues across the University to pull together exam resources and sources of support into one central hub? 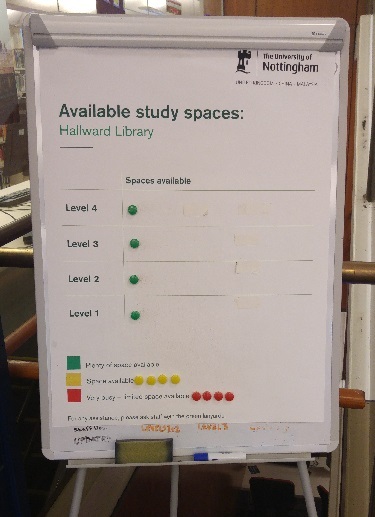 Space availability boards near library entrances – lookout for them and ask roving staff for help. We know better than anyone how busy our libraries get during the exam period, so we’ve booked a number of extra study spaces for you to use. Rooms are available across University Park and Jubilee Campus, Monday-Friday until 8 June, from 8am-6pm unless otherwise specified. There are also details of study spaces within Halls and Schools. Visit the Study Anywhere webpage to find your perfect place to study. From this page you can also find out where available PCs are around campus, and follow links to a host of useful exam resources via our Exam Ready webpage. Don’t forget that the libraries are also running a 24/7 service during the exam period for all you night owls. More information on that here.